As we get older, even the simplest of tasks, like using the restroom and bathing, can become problematic for us. For those with mobility issues, accessing the bathroom or the shower can be nerve-wracking. The fear of falling on a slippery surface is very real, and with age, we don’t have the strength or mobility to avoid or recover easily from a devastating fall. Advantage Home Health Solutions understands that safety and peace of mind are of the upmost importance to you and your family. You can rest easy that our products will aid you in your everyday activities. We have a variety of accessibility devices for bedrooms and bathrooms to ensure your safety. We provide more extensive modifications for those who need barrier free access to their shower. If bathing is a priority, we have slide-in tubs or walk-in tubs to meet specific requirements. Renovations can be quite costly which is why we provide you with the knowledge and information you need to make a choice suited best for you. A unique option for clients who don’t have access to their full bath on an upper floor or they don’t have the option to renovate a bathroom, is a Portable Shower. Without the ability to access to a full bath, the Portable Shower provides a refreshing shower and it takes up only a small amount of space. Clients have the option to purchase or rent as is the case with many of our products. Transform your bedroom and bathroom into your personal space again with our accessibility renovations. 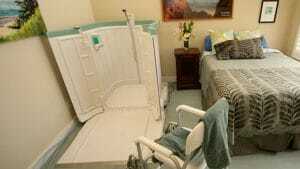 Creating an accessible bathroom or bedroom that fits your needs is easy with Advantage Home Health Solutions’ knowledge and expertise. If you’d like to learn more about the accessibility renovations we offer for the bedroom & bathroom, contact us for a consultation. We have been extremely happy with your customer service. After dealing with your staff we appreciate your honest advice and your willingness to accommodate us when at all possible. We look forward to dealing with you in the future. I experienced service at its best from this awesome team. Their service did not begin and end with the sale. They provide support / knowledge and the right service to meet your specifically tailored needs. They are the go to team! You have always been so great to our clients. I wish you and your team great success. Thanks again for all that you and your team do for our clients. We contacted Silver Cross (now Advantage Home Health Solutions) for information pertaining to Stair Lists. We were contacted the very next morning and an in home visit was scheduled for later that day. Upon the visit and confirmation that we would be able to install a stair lift, we received a quote the next morning and installation was completed 2 days later. We cannot express enough how courteous and expedient the services were. The service was provided with extensive knowledge, professionalism and friendly mannerisms. We would highly recommend the company to all our family and friends. Thanks so much for making my dad's life so much easier and fear free of stairs now. Silver Cross (now Advantage Home Health Solutions) was one of the providers I considered for the installation of a porch lift. Phil's personal interest, attention to detail, competitive pricing and excellent service was so impressive compared to the others, that it was an easy decision to his company. I had complete confidence in him and he fulfilled the order on time and as promised. I have continued to use his business for subsequent needs and the service continues to be excellent. It is always a pleasure to do business with Phil and his staff. I dealt with Silver Cross in Ontario about 10 years ago so when I found myself in need of a Stairlift in my home in Calgary, I contacted them based on the great customer experience I had previously. I certainly wasn't disappointed and experienced the same, if not better, service than I had before. I appreciate the independent advice that they are able to provide and I really felt that my best interests and my satisfaction were the primary consideration. Thanks again for the superior customer service. If it were not for Joan and her old fashioned wherewithall, utter kindness, knowledge of the Alberta Health system and billing procedures, and all around super attitude, I'd still be housebound. Thank you are the only two words I have, but believe me, they deserve a whole lot more, truly a wonderful, caring and old fashioned service company. I highly recommend them to anyone. Thank you so much for all your support and assistance towards my mother, Alice. I called her late afternoon yesterday and asked her, if she received any speeding tickets. We followed her when she went for lunch and we had to tell her to slow down. Believe she is very happy and having fun with the scooter. Halleluiah!!! By the way, Sean is a great guy and is doing a terrific job installing the equipment. He really enjoys his job. How can we make your life better? How can we help you stay independent? We want to help you understand what options are available so you have the information you need to determine the best solution for you in your home. We welcome your inquiry! Copyright © 2018 Advantage Home Health Solutions.